Solo attended the Siemens annual supplier event 2018 on the 22nd November. The event was an opportunity for select suppliers to showcase their expertise across the Siemens supply chain. The day was made up of formal presentations and interactive activities. Rob Pugh Solo’s Commercial Director took the opportunity to talk about some of the work Solo has been developing with Siemens and how the company is expanding its operational capability. The evening comprised of a formal black-tie dinner followed by an awards ceremony. Solo was delighted to be awarded the ‘MAKE AMBITION WORK’ winner 2018. 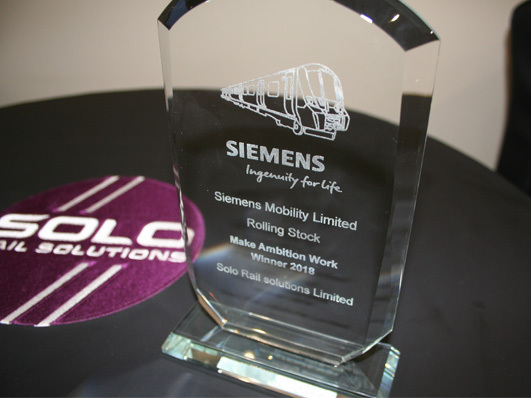 This is in recognition of the close working relationship Solo has developed with Siemens Mobility. In particular Solo’s ability to tackle production and logistics problems on behalf of the client ensuring smooth transition from supplier to end user. dedicated support teams that a world class client such as Siemens has recognised our efforts on their behalf. Solo will be exhibiting at Railtex 2019 where new initiatives in the company’s development will be showcased.